Imperfectly Painted: Tis the Season?!?!? Ok, I have a confession. I have some obsession with Christmas. I know a few posts ago I was talking about being ready for fall colors now I'm talking about winter. I don't if it's the extreme heat and humidity here, but there comes a time in summer when I put on the Christmas music on full blast and pretend it's cold outside and everyone is full of good cheer. I'm not a religious person, but I always loved the holiday spirit. I love the music, the decorations, the lights, the season of giving, food, and the scents of cinnamon and pine. However, since I live in Florida, the only scents of pine I get come from a Glade plug-in or Febreeze air freshener spray. I crave Christmas in summer. I get so excited for Christmas. I'm the psycho who starts decorating November 1st. I had to stop doing that because when it came time for Christmas I was WAY over it. I've managed to wait until the second weekend in November to start decorating. Anyways, since I'm in the Christmas spirit too far in advance where some of you may think I'm insane...I'll share with you some of my favorite colors of the season or anytime of year! 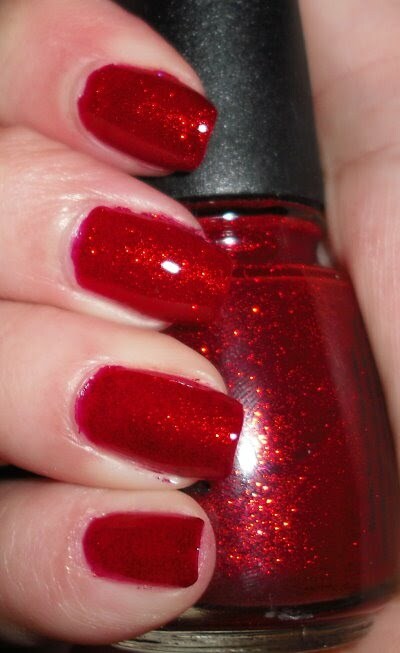 Ruby Pumps is a classic favorite by China Glaze. I don't think I've come across anyone who hates this color much less doesn't have it in the top polishes of all time list. It is a cooler toned red jelly with red micro-glitter throughout. Dorothy would be proud. This would definitely beat out my make-shift ruby slippers I made in the 1st grade. I made them using tennis shoes, obnoxious amounts of goopy glue, and sprinkled enough red glitter that even a Drag Queen would turn her nose up at! It was a fail, but China Glaze Ruby Pumps is definitely a win. 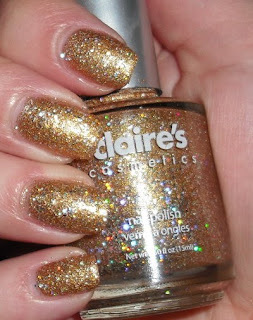 Goldmine is an amazing sparkly blingy polish. It's gold foil-glitter base mixed in with silver glitter and chunkier holographic glitter. This could take the place of the dreaded Christmas sweater, but in a good way. It is a gorgeous polish. My only complaint is it does feel gritty on your nails, but I can dismiss that because of how pretty it is. 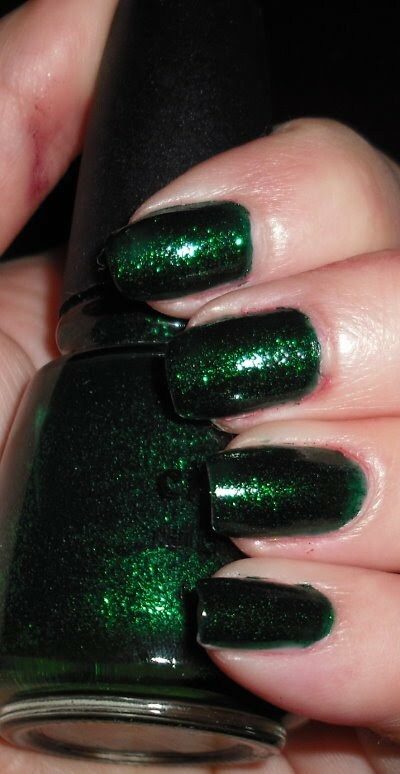 Emerald Sparkle is another awe-inspiring amazing creation by China Glaze. This is one of those polishes that is favorite by all. I completely agree it deserves its glorified status. It is a rich emerald green jelly with green micro-glitter mixed in. I am not a fan of green polish, but this one has stolen my heart. That's all for today. Now, I could go for a glass of eggnog, some Christmas carols by the fire, and Home Alone movies, but it is currently in the mid 90's with 80% humidity, there is no eggnog in sight, and I don't own the Home Alone movies. Oh well, I can wait until Christmas, or at least until the 2nd week of November!!! I always wish it was Christmas in the middle of summer haha :) But I think i'm going to do a ruby pumps mani tonight I haven't worn it in awhile! Something in the air methinks. I'm super-sparkly silver at the mo. Whoa, I'm totally blasting xmas music right now as well! I definitely need to get Emerald Sparkle soon, been lemming it for awhile, looks great! And Emerald Sparkle is stunning. jaljen- I guess it is, I'm glad to know I'm not the only person craving Christmas! Ping- Yes you need Emerald Sparkle it's a great color! I love Christmas music year round. Jeweled- Eggnog is good across the board. I love potato latkas! love your new blog layout!!! and i dig xmas in july, we should do a theme week! Ahh Home Alone movies. The memories, although I think those movies are good anytime of the year. And I totally concur with your polish choices.